Action from a Featherstone Rovers ladies game last season. 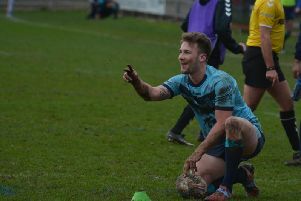 Jonny Payne believes an earlier start to pre-season training will see Featherstone Rovers Ladies become more competitive next year. The Ladies head coach says that his side have started their preparations for the upcoming campaign three months earlier than last year. Featherstone won just one game in the Women’s Super League last season but Payne is hoping for better success in 2019. “We’ve started pre-season three months earlier than last time and that conditioning is going to have a massive impact on us,” he said. “Fitness was a big issue for us last year. We were always competing for half of the match, but then you could tell the teams who were training more than us. We’ll definitely be stronger in that department next year and our younger players will have another season under their belts.